Claude Monet was unquestionably the most influential artist of the Impressionist movement. Known for his broken brushwork and exceptional ability to capture the transient, flickering effects of light, he became the figurehead for generations of artists. Although Monet’s exploration and depiction of waterlilies is favoured by collectors and therefore reach record prices at auction, it is interesting to note that he ceased to work on a series of waterlily paintings in order to revisit the coast by Pourville. It was here that Monet chose to escape the difficulties of his personal life, search for solace and tranquility, while ‘gain[ing] strength from the sea air’. 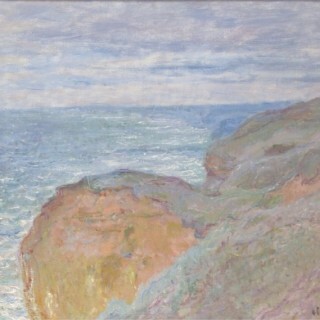 The present painting depicts the coastal view, east of Pourville and perfectly encapsulates Monet’s concern for the fleeting effects of light and atmosphere. Instead of a lurid, bright palette, Monet uses an unusually pale selection of pinks, soft oranges and light blues, complemented by broken contours that hark back to his earlier works. This painting was part of the first series of works that Monet completed after the exhibition of his Rouen Cathedral series. However, unlike his Cathedral paintings, this composition appears to have been painted at an indeterminate time of day. 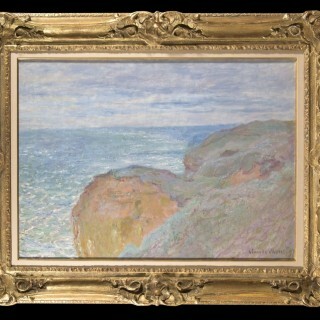 Nevertheless, Monet has been able to faithfully record the impression of bright light reflecting in the water below and the mingling, hazy colours of the cliffs. Monet first painted this view in 1896 and when he returned in 1897, he discovered that the picturesque viewpoint was threatened by burgeoning gentrification: “It so happens that the spot at which I have begun so many canvases, higher up, towards Dieppe, is going to be closed to the public; a Dieppe company has rented all of this land starting from the Val Saint-Nicolas in order to use it for playing all sorts of English games, as well as archery and pigeon-shooting”. Clearly, this site resonated with Monet: he loved the coastline and escaped to it in search of solace, choosing to depict it for posterity in 1897.